Paragraph Linkers are often referred to as "discourse markers". Discourse means "pieces of language longer than a sentence" - and a discourse marker is a word or a phrase that shows how sentences are logically combined into larger wholes such as paragraphs and how paragraphs are combined into larger wholes such as essays. 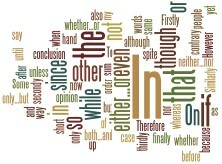 Used correctly, discourse markers - or paragraph linkers - will greatly improve the argument and logic of an essay. They will help the reader understand the structure of your argument, they will make your points clearer - and they will make the connecting thread ("den røde tråd") in your essay more easily visible. The list below is by no means an exhaustive list of discourse markers. It is merely a short list of tools to improve your essay and argument structure. on the other hand Dickens' text, on the other hand, seems very dark. while/whereas While/whereas Dickens uses imagery, Jason Kennedy uses irony. however The narrator, however, reads Camus. nevertheless Nevertheless, the text ends on a hopeful note. similarly Similarly, the Kinks' song deals with a man who has a very repetitive job. on the contrary The narrator is not like the other workers. On the contrary, he is an individual. furthermore He is unsatisfied. Furthermore, he is intelligent. in general In general, factory work is described as uninspiring. apart from Apart from the narrator, all the workers seem strange. for instance He shows his discontent. For instance, he says that "..."
therefore He is unhappy. Therefore he quits. in other words He reads Camus. In other words, he is interested in existentialism. to sum up To sum up, the texts all deal with the problems of a mechanised existence. in short In short, the theme is man vs. machine.